Unearthed this in my studio recently - Circa '77-'78. Funny thing is, I still FEEL like I can leap tall buildings in a single bound. 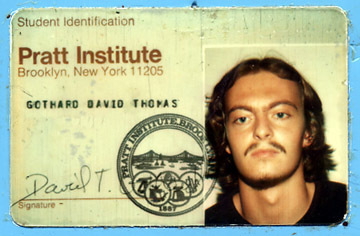 David, I've still got an early ID card with a similarly hewn moustache. Though I prided myself on my craftsman's skills, I could never seem to get mine trimmed straight. I'll warrant that beneath the untroubled countenance in this photo beat the heart of an artistic soul yearning for connection with arty babes.